About a month BEFORE having my first baby (this was at my baby shower, in case you were wondering...) I remember someone very kindly telling me not to worry if it took me a long time to lose all of the weight I was gaining. That person continued to explain that it had taken her almost nine months to get it off, and I shouldn't be concerned if it took me a really long time too. Okay. Don't ever do that to someone, please? At this point I was very full-faced and very pregnant with a very stubbornly breech baby. I was worried about the birth and breastfeeding and the health and my sweet little girl--basically all of the things you would expect a new mom to be concerned about. Other than the normal feelings of largeness, I was not uncomfortable with my weight-gain; I was just keeping my focus on the important moments ahead of me. Reminding someone of how much weight they are gaining during a pregnancy is really not necessary no matter what your intentions are. After a (long-fought-against-but-ultimately-wonderful) c-section birth and an up-and-down recovery, the "lose the weight" comments kept echoing in my brain and I responded like any self-respecting, stubborn red-head would. I kept digging my heels in. "My body has changed. I just need to be comfortable with my body as it is now." There is definitely a place for this type of thinking--especially when you are in survival-mode in the early days. You need to spend some quiet moments reflecting on the violent miracle that your bones, muscles, brain, and heart just experienced. It is, however, an easy place to get stuck. Your body has almost certainly changed permanently in some ways--bigger feet, wider hips, stretch marks. I had all of those. I got caught up in the constant "momming," and I neglected my own health and fitness using excuse after excuse. After my son arrived two years later and I had gotten through the food-addict's nightmare of gestational diabetes, I knew there were aspects of my body I needed to reclaim. I needed to reclaim them not from the changes brought about by growing and birthing two babies, but from the sedentary complacency that had crept into my life in those early desperate days with my daughter. I needed to ask more of my heart by asking more of my body and seeing where it would take me. I have already written about Fit4Mom's Stroller Strides classes and the impact they have had on my life. Body Back is another program from the same amazing company Fit4Mom. I am glad every. single. day. that I tried out that first free Body Back class because it showed me what my heart and body are capable of when I work hard. It is a class without your stroller and without your kiddos, so you lose the excuse of a crying child needing a snack to take a break. It is just you competing against yourself and shattering the limitations you thought you had. Below is an overview of the program and an explanation for why I believe it produces such impressive results. 1. 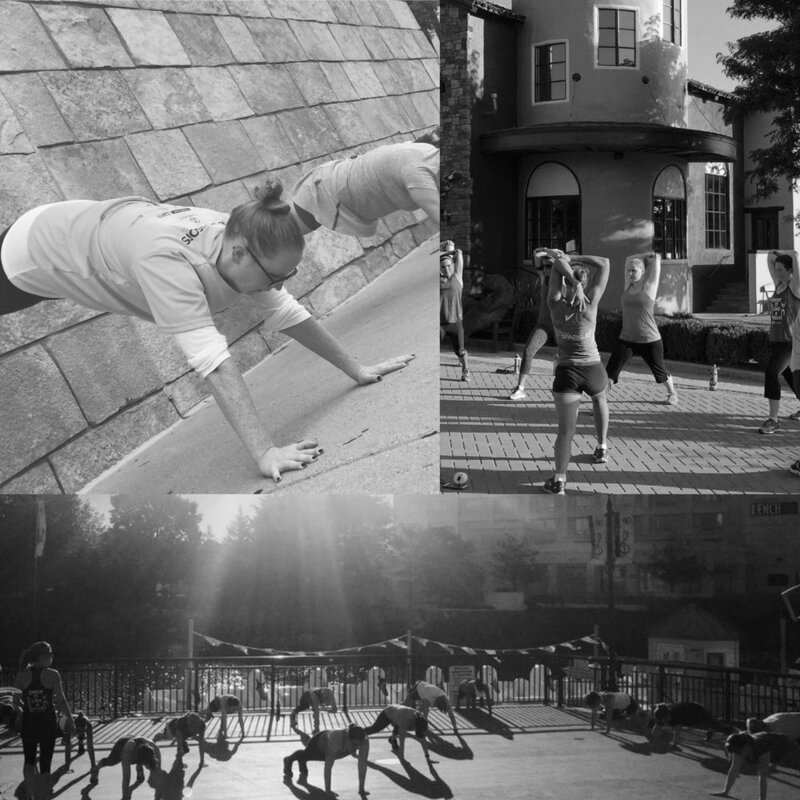 "Traveling" classes are outside and involve running from place to place to do different exercise combinations. 2. "Rounds" involve multiple sets where we do a cardio exercise (e.g. burpees) then strength (e.g. lunges with bicep curls) then core work (e.g. Russian twists) each for a minute at a time and then repeat that round once. Then a (very) short water break before a new set of exercises--usually there are about 6-7 "rounds" per class. 3. "Circuit" classes entail moving around to different "stations" and doing a different exercise for one minute at each one. You usually do a circuit of all of the stations at least twice often with a group exercise in between circuits. All of the classes generally follow the cardio-strength-core pattern, but each class feels fresh and different because they all include different exercises in different patterns done with different modifications and equipment. A lengthy stretching cool-down follows the intense work-out. My favorite part of a Body Back class occurs of at the very end. We do a relaxation mediation that helps quiet my mind before I go home. My body always feels like jell-o at the end of the classes, so the transition from stretching to relaxation feels amazing. I have never left a Body Back class without feeling energized at the end. And as a recovering exercise-hater, that is really saying something. Assessments: There is also always a "before" assessment class and an "after" assessment class where photos are taken, measurements done, and fitness levels are tested so that you can approach your goals in multiple ways. This is not a weight-centered program (though believe me you will lose weight if you follow the recommendations and attend all of your classes). You use hard work and intense focus to achieve self-created, measurable benchmarks. See this post for more about my personal goal-setting adventures. Once a week you weigh in and record it to see your progress, but it is always clear that the number on the scale is not the most important part. The instructors are your personal coaches and cheerleaders every week. They help you reach your desired fitness destination by giving you tools for your journey such as ensuring good form in classes, providing valuable nutrition guidance, and overall promoting positive thinking. They manage a Facebook group for support and coaching throughout the week. There are challenges like "water drinking" or "post pictures of your healthy breakfast ideas" or "meal planning" that promote healthful living without being annoying or guilt-inducing. I participated in these challenges because it made it fun and kept you connected to your "teammates" during the week. This is the crux of what makes Body Back so different from any other fitness class that meets twice a week. There are so many places you can go to "get a good workout," but I think Body Back, like Stroller Strides, offers something you won't find other places. It seems that nowadays we are deluged with options to help us lose the weight with this crash diet or that set of videos or this cleanse (which is incidentally one of my LEAST favorite words). What I love about the Body Back 8-week program is that you develop relationships with your instructors and your session "teammates" (my word), and these relationships keep you excited about coming twice a week to your crazy-tough workouts. You feel like you are in it together, and seeing everyone else's progress encourages you and helps you work harder each class. We chat about our children and learn about each other's lives while watching everyone strive to achieve goals. "Do I really want to eat three pieces of pizza? Dana will be reading this..."
After sending in your journal, they reply with small but encouraging suggestions for improvement. There is no shaming or indictments or guilt-inducing nitpicking of the occasional bad choices. They just offer helpful ideas. But I can't lie, I sometimes I totally ignored them because creating good habits in a recovering junk-food addict is a long process. [Sorry Katie and Dana, but yogurt with cinnamon will never be legitimate substitute for ice cream. I wish it was, but I just can't.] Nevertheless, the food diary is a completely vital part of the journey and helped me lose an average of two pounds a week. Most studies seem to indicate that exercise without a change in diet will yield disappointing results. Body Back combines the diet and exercise components, so that participants will see amazing results over the eight weeks. The whole team behind your Body Back Session will constantly be there to support you, but they never expect perfection. Because let's face it, no one is perfect and eating a few pieces of chocolate should not derail you or defeat you. The real defeat occurs for any person--but especially a mom--when she decides that she is not worth the time and hard work that it takes to make or achieve a new goal. When you accept the status quo and decide that you are satisfied to remain in a constant state of dissatisfaction with your body and your life, you rob yourself of meaningful experiences. I was trapped by that same satisfied dissatisfaction once, but after Stroller Strides helped me get out the door, Body Back helped me to challenge myself and learn what I could accomplish when I really put in the effort. Note: Fit4Mom has multiple locations all over the country where you can take Body Back classes. If you unfortunately don't live near one, I still encourage to find a way to make some fitness goals and develop a solid strategy for achieving them.